The second episode in season two of The Borgias remained firmly planted in the historical period of early 1495, with King Charles VIII of France still in Naples. The episode provides some fascinating art historical moments, including perhaps the first words uttered by artist Pinturicchio since the sixteenth century. 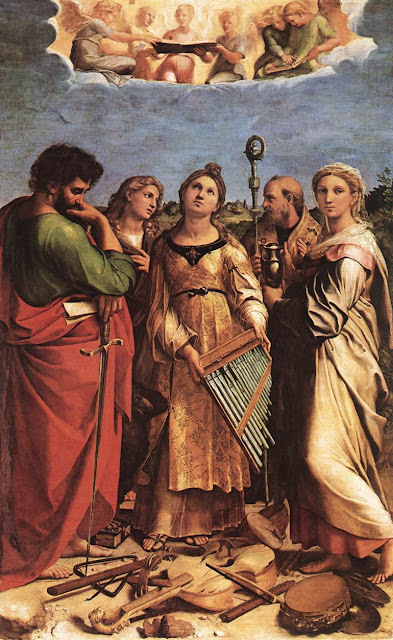 Cesare takes some time to gently school us on the iconography of Saint Cecilia, and playful references discernible to those familiar with the history of Pope Julius II were also made. The key focus of this episode was to tragically end Lucrezia's forbidden relationship with stable boy Paolo, perhaps providing a traumatic emotional context to the impending violence suggested in Lucrezia's and Cesare's future. One aspect depicted in the first episode that I had omitted to cover was the capture of Alphonso II of Naples. Depicted as an arrogant young man (though actually in his forties at the time), the show suggests he fled to hide near Mount Vesuvius, only to be apprehended by Charles' troops and subjected to the cruel tortures that characterised the reign of Alphonso's father. The second episode shows us a very dead looking Alphonso, destined to join the macabre Last Supper of Corpses, as he is prepared for taxidermy on Charles' orders. Scanning the historical record, we find a quite different outcome. Alphonso II is described as abdicating the throne of Naples on January 28, 1495. The diary of Johannes Burchardus described the Pope being informed that Alphonso II had withdrawn from Naples with four ships laden with treasure, believed to be headed for Sicily or Spain. In actuality the king retired with a dozen monks and contingent of staff to the Castel dell'Ovo, a seaside location off Naples. Diarist Marino Sanudo - an oft encountered source of information for the period - comments that it required five galleys and two transports to relocate his treasures, manuscripts, and staff (Setton). The sojourn did not last long though, as Alphonso II died in Sicily in February of 1495. We can not be sure why the writers chose this detour. Alphonso was a peripheral character and reports of Charles VIII campaign are not littered with accounts of cruelty and torture. If anything the rampant spread of Syphilis among French troops, reportedly from an estimated population of around 800 prostitutes in Naples (Di Cicco) suggest the French soldiers were otherwise occupied. Intriguingly, historical names assigned to this disease reflected the French campaign in Naples - in Renaissance Latin the disease was described as Morbo Gallico, in French it was termed Mal de Naples. One of many sixteenth century treatises published on Syphilis in the wake of the French passing through Italy. 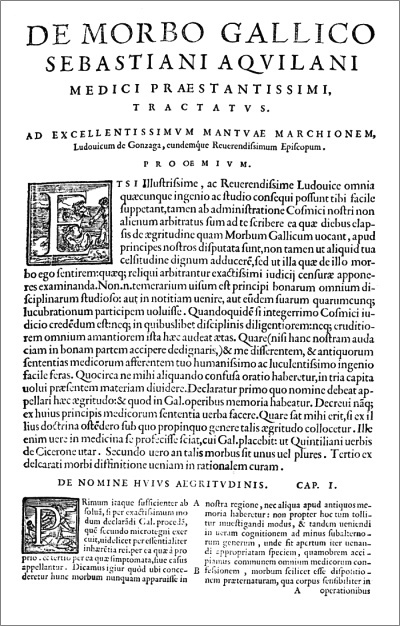 Sebastiano Aquilani's De Morbo Gallico was first published in 1506. Perhaps the most thrilling art history related reference yet were some short lines of dialogue from Pinturicchio directly to Cesare. This scene takes place inside the convent dedicated to Saint Cecilia, which Pinturicchio seems to be working on a fresco for. It is hard to make out the design of his fresco in the angles offered, though Pinturicchio is noted to have decorated the ceiling of the Ponziani chapel in Santa Cecilia in Trastevere. The details of the convent Ursula Bonadeo has fled to have always been sketchy, containing a pastiche of works by other artists from slightly different time periods. If more is seen of the fresco in later episodes, an identification may be possible. In this scene, Cesare - still lovesick for Ursula - appears clutching a musical instrument, an iconographic attribute of Saint Cecilia. Perhaps the most well known Renaissance depiction of this was Raphael's c.1516-17 version on wood panel, which is now in the National Library in Bologna. It was nice to have Pinturicchio have some lines. He had been a peripheral character in series one, with this scene further highlighting his role in the Borgia artistic legacy. Pinturicchio's enduring fame as an artist likely suffered because of his association with the Borgia, and the fact that Julius II was so intent on eclipsing Alexander's artistic legacy he hired none other than Michelangelo and Raphael to stamp his mark on the Vatican. This being said, in art history texts, particularly those concerning Raphael, Pinturicchio's significant influence is noted. Nicole Dacos, an art historian writing on Raphael's Vatican Loggia designs notes that it was Pinturicchio who was among the first (in 1500) to popularise in the classically inspired grotesques first seen when he descended to the Domus Aurea. Other authors have explored his influence on Raphael's tender Madonna and child scenes, where Pinturicchio's style influenced Raphael to step away from the more rigid compositions of Perugino and explore arrangements of figures in a more tactile and intimate pose (see Oberhuber in refs). Cardinal Giuliano della Rovere (future Pope Julius II) is still recovering from the poisoning orchestrated by Cesare in the previous episode. He is cared for by nuns, and has grown a beard. This was a subtle reference to the beard he later grew as a sign of grief after the fall of Bologna in 1510, during the Wars of the League of Cambrai. 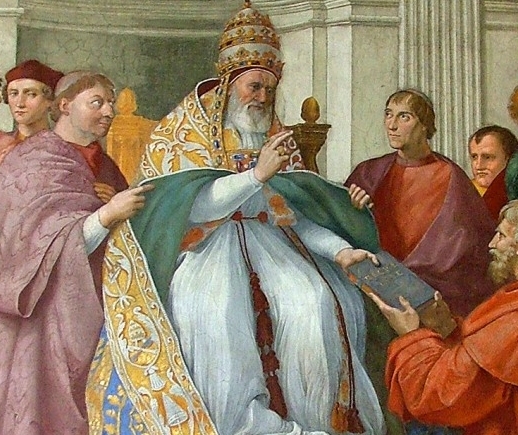 Writers at the time noted it was not customary for living Popes to grow a beard (though commonly depicted as such posthumously in the guise of a saint). Raphael and his workshop assistants, working to decorate what is now known as the Stanza della Segnatura at this point in Julius II's reign depicted his likeness with and without beard on either side of 1510 (Zucker). In the show - to cement this point, and make a firm allusion to Giuliano's future role as Pope, a monkey is introduced to test food for poisons. When pressed to give the monkey a name, Giuliano picks "Julius" as a fitting title, after his great Roman namesake, Julius Caesar. With stable boy Paolo turning up in Rome to see his child, things were not likely to end well. Cesare, understanding Lucrezia's "impossible" love predicament offers a form of compromise, arranging Lucrezia and her lover to have one night together. Unfortunately Juan catches wind of what is happening, and Paolo does not leave Rome alive. Holliday Grainger's acting in these scenes was nicely handled, particularly the moment when she realises she will be forever parted from her lover. Her portrayal gave a tangible sense of the finality of this scene, and the devastating emotional effect the writers want this to have on her. Kudos to Holliday Grainger, and to the writers for making Lucrezia undeniably human in this scene, something which history and the distortions of many subsequent authors have not permitted. Grainger was amazing in this scene - how will this trauma affect her character in future episodes? Having caught Alexander's eye, Giulia Farnese moves to ensure that the male-masquerading artist Vittoria will not take over her position of favour, so allows Vittoria to join them in bed. Alexander of course has no qualms contending with two beautiful women in his bed, which seems in the spirit of some of the more colorful reports of Alexander's late night revels, including a description by Burchardus of one particular party which included "fifty honest prostitutes, called courtesans...who danced after the dinner with the attendants and the others who were present, at first in their garments, then naked." There is of course less tangible evidence from the historical record of Alexander's actual activities in the bedroom, details of which are instead insinuated by slanderous opponents or imaginative writers. Giulia's cunning plan pays off, and by the end of the episode she is given authority to preside over the funds of the Papal office dedicated to caring for the destitute. Another art historical cameo appears in the scene where Juan is being pestered to choose a bride from among four Castillian women from Spain. 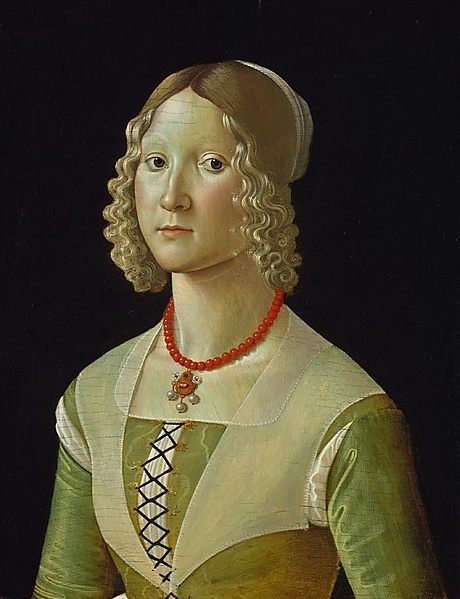 Of the four, one that was immediately recognisable was the Portrait of Selvaggia Sassetti, attributed to Davide Ghirlandaio, which is at the Metropolitan Museum in New York. The Sassetti were a prominent Florentine family, hence the use of this portrait to depict a Spanish noblewoman is somewhat imaginative, though perhaps misleading. It should be noted that the image shown on screen appears to be backwards in orientation to the actual painting. Not unlike the scene depicting the Medici dining room in season 1, this suggests an editing issue, with the film frame horizontally or h-flipped, rather than the painting being reproduced backwards. The French forces will surely be leaving Syphilis infested Naples soon and begin their slow march out of Italy. With Juan forcefully poking around, and Paolo dead, we can also expect to see further conflict between the Borgia siblings. Hello anon. Patience! With the show's recent detour showing Alexander and Giulia's interest in orphans and the destitute, I'm waiting to see what will become of the child (hence the last line of my review) before mentioning this background. The subject of the Papal Bulls mentioning the "child of Rome" (Giovanni Borgia) may be discussed if they are covered in show. Everything beyond this is speculative at best, and not described by primary source accounts. It has been equally vehemently argued (across the ages) the child was Cesare's or Alexander's. Also, I would like to remind the readers that the show is ostensibly set in 1495 at present (the French are still in Naples), not 1498 - hence we may still see a child from another source. eg. Cesare and Ursula? Giovanni himself lived until 1548 and was noted to accompany Lucrezia on occasion - leading to the speculation that she was an illegitimate child of hers. It will be interesting to see what the show does with the child. As far as the historical record is concerned, Paolo, an iliterate stable boy in the service of Giovanni Sforza, is indeed "wholly invented". We can say that much - though the histories of the era unfortunately do not pay much attention to such figures.